Vitamin B-12 is a water-soluble B vitamin essential for carbohydrate metabolism and energy production. It also plays an important role in the formation of healthy red blood cells. Folic acid—also known as folate or folacin—is a B vitamin found in green leafy vegetables and, in lesser amounts, in fruits, sprouts, brewer’s yeast, liver and legumes. Often working in conjunction with vitamin B12, folic acid functions primarily as a methyl-group donor involved in many important body processes. Folic acid also plays a role in the formation of SAM (s-adenyl methionine), which regulates many functions, including mood. 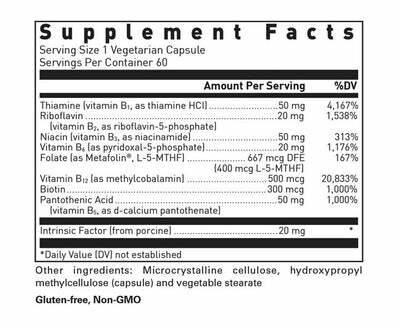 How does vitamin B-12 and Folic Acid support health? Folate is an essential B vitamin needed by the body to produce and maintain new cells, as well as for the creation of DNA and RNA. Folate is needed for the maintenance of healthy homocysteine levels. Folate plays a part in the formation of SAM-e (s-adenosyl methionine), a compound that regulates many functions, including mood. Women who consume healthful diets with adequate folate may reduce their risk of having a child with birth defects of the brain or spinal cord. Folate intake should not exceed 250% of the Daily Value (1,000 mcg or 1 mg).